While businesses are pouring all their resources, time and money into Google and Facebook, they are ignoring one of the most underutilized platforms out there: Pinterest. The site where many go to find recipes and scope out DIY projects is actually one of the most effective marketing platforms out there right now. 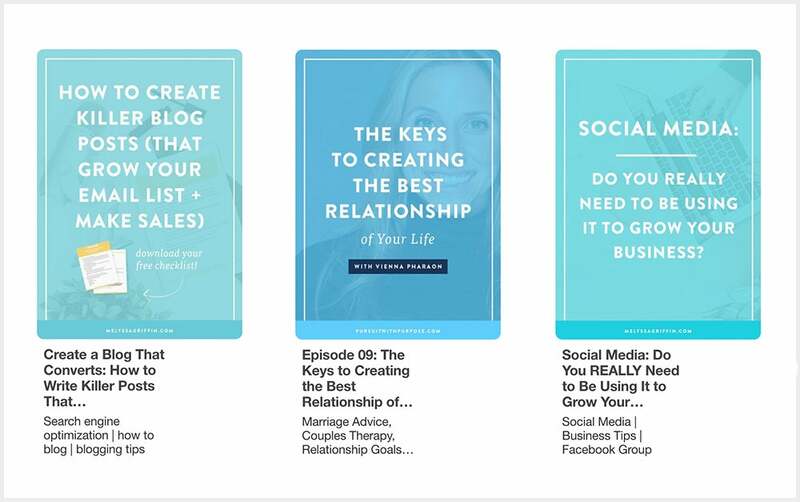 By using Pinterest strategically for my website MelyssaGriffon.com, I was able to double my website traffic in three months and exponentially grow my email list. Before utilizing my Pinterest strategies, I had about 2,000 subscribers. Twelve months after implementing my strategic Pinterest system, I was up to 40,000 subscribers. Now, after two years, I'm nearing 200,000 subscribers. It's kind of insane. And this new surge in traffic and subscribers rapidly grew my business, too. Within one year of using my Pinterest strategies, I literally 5x-ed my revenue! Seriously, Pinterest is my secret weapon, and now I want to make it yours, too. Check out these three essential Pinterest strategies that will help you turn this often-neglected platform into your own marketing powerhouse -- no matter which niche or industry you're in. 1. Create a profile that attracts the right people. When you initially create a blog or business, what's the first thing that most experts tell you to do? Figure out who your target audience is. (More info on how to do that here). Your Pinterest account is no different. One of the common mistakes people make on Pinterest is that they don't tailor their profile and content to their target audience. If you want to see big results on Pinterest, then you'll need to create an account that is specifically designed to attract the right people. A brief bio that explains who you help, how you help them and gives people an opportunity to opt-in. Keywords in your profile name. Let's go into more depth on these concepts. In the actual text of your bio, you shouldn't make it all about you. Before people will care about you, they will care about how you can help them. Here's a quick formula you can use: I help (who do you help?) do/become/learn (what do you help them with?). After that sentence, which already has your profile visitors engaged in what you do, you want to entice them with a call to action. A call to action is simply a way for them to do something, like opt-in to your email list. I like to direct them to some sort of freebie I offer, like a free email course, webinar or PDF download. Now let's chat about your profile photo. In this case, I recommend heading out into some natural light and taking a smiling photo of your mug. You don't need fancy camera equipment to do this, as most cell phone cameras and good ol' sunshine will do the trick. Lastly, you should add keywords into your profile name. This way, your profile has a higher likelihood of popping up when someone searches for one of those keywords on Pinterest, or even Google. For example, I create content for entrepreneurs and bloggers, so my Pinterest name says, "Melyssa Griffin | Entrepreneur + Blogging Tips." That way, if someone searches for one of those topics, I have the chance to appear in their search results. Also, it makes it super easy for people to see what I'm all about when they land on my Pinterest profile. Ultimately, by creating a strong Pinterest profile, we're making sure that when the right person visits your Pinterest account, they stick around. Even if you have a small Pinterest following right now, there are probably hundreds of people who view your profile each month. Do you want those people to see your profile, immediately resonate with what you do, and hit "follow," or do you want them to be confused and peace out? The answer to that question is why your profile is so important. Once you've created a sweet profile on Pinterest, it's time to dive into the big stuff, like implementing Pinterest SEO. A lot of people lump Pinterest in with other social media platforms, like Facebook and Instagram. But Pinterest is far from being a social media site. Instead, Pinterest is a search engine, like Google. Since Pinterest is a search engine, we have to implement Search Engine Optimization, or SEO. SEO is a fancy term that essentially means "optimize your content so that it shows up as one of the first posts in search results." If you go to Google right now and type in a word or phrase, you'll get a list of articles and websites you can read, which are meant to be ranked in order of their helpfulness and relevance to the topic you searched for. Pinterest acts in the exact same way. That Pinterest feed you see? It didn't happen by mistake. Pinterest uses an algorithm to rank its pins in an order that they think will be most relevant to their users. Because think of it this way: if you log into Pinterest and your feed is full of tons of pins that are irrelevant to you and your interests, what will happen? Eventually, you'll stop using Pinterest. And if people stop using Pinterest, then Pinterest loses money, users, investors and eventually their entire brand. So, it's in their best interest to use algorithms that show you content they know you'll love. What does this mean for you? It means you have to ensure that Pinterest is ranking your content in their feed -- and preferably in one of the top positions. These posts are ranking higher than posts at the bottom of my feed (after I scroll down) and will therefore get more repins and click-throughs. How can you apply it to your own pins and account? Let's dive in. Create boards that your target audience wants to follow. On your blog, you probably have "categories" to organize your content. If you're a travel blogger, would you have a category on your blog for "gluten-free recipes"? Probably not. So, remove any boards that are irrelevant to your ideal audience and add new boards that your target peeps would be searching for. Overall, I recommend having at least 20 boards on your profile. Warning: If you delete an entire board, it will also delete any followers who are just following that particular board. Don't freak out. It's okay to lose followers that aren't interested in your main message or niche. Plus, by narrowing your focus on Pinterest, you're only going to attract more of the right followers -- and usually much more quickly, too..
Add keywords to your board descriptions. This is important for a few reasons. First, your boards themselves can rank on Google. This means that if someone types a phrase into Google, your Pinterest board could pop up as a top search result. That could equate to tons of new followers, website visitors and email subscribers. Second, on Pinterest, users can sort by "boards" when they search for something. By adding keywords to your board descriptions, you're increasing the likelihood that your board will rank in those results. Add strategic descriptions to your pins. Perhaps most important of all is to SEO the heck out of your pins themselves. Your pins are really the gateway to the rest of your brand, so they require the most effort. On every pin that you share from your website, you should write a keyword-rich description. Of course, writing descriptions for things that you pin from other people's websites will only pump up your SEO, but doing so takes a LOT of extra effort and I don't personally think it's necessary. Whether you write descriptions for the other stuff you pin or not, writing descriptions for your content is totally necessary. What do you include in this description? Keywords. One of the most important principles of SEO is to use keywords to attract the right people. What would someone be searching for in order to find this particular pin? Make a list of 5-10 long-tail keywords, then add the best ones into your pin's description. "What's a 'long tail keyword,'" you ask? Well, it's a keyword that's at least 2-3 words long. See, if you fill your pin descriptions with general terms like "fitness" and "healthy" then you're competing with the millions of other people using those simple terms. Plus, when people search for things on search engines, they rarely search for general words. Instead, they come to search engines with specific problems that they want to solve, which means that they use specific, descriptive keywords to find the right information. So, if you were pinning a piece of content about "How to Become a Vegan in 5 Simple Steps," then your keywords wouldn't be things like "vegan" or "vegetarian." Too general. Instead, you might use words like, "How to Become a Vegan" or "Easy Vegan Recipes." Remember: Use the types of phrases that your audience is searching for. Not sure what people are searching for on Pinterest? Well, luckily Pinterest makes this really easy for you to figure out! Simply pop over to Pinterest, type in some of your general keywords (like "vegan"), hit “enter” and see what Pinterest suggests! For example, in the image above, Pinterest suggested terms like, "vegan lifestyle" and "vegan recipes." You could even go a step further (to make your keywords even more specific) and then search for those terms (like "vegan lifestyle") to see how Pinterest can make them even longer by offering more suggestions. See, if your pins utilize keywords, then you drastically increase the likelihood that your ideal audience will see your pin when they search for something on Pinterest. Pinterest also has something called "picked for you," which are pins that Pinterest literally picks for you, based on your interests and pops into your Pinterest feed. If you don’t use keywords, then it will be hard for Pinterest to find your pins and recommend them to people who may become loyal followers after seeing your pin as a "picked for you" article. So, bottom line for Pinterest SEO? Create boards that target your ideal audience. Add strategic descriptions to your pins themselves. Every time you publish a new blog post, pin it onto Pinterest. Literally, as soon as I publish this post, I will use my Google Chrome Pinterest extension to pin it onto Pinterest. But I don't just pin it once. First, I pin my content to a board JUST for my blog posts. It's the first board on my account and stores content from my own site. I suggest you create a board like this, too. It's a great way for potential followers to get a glimpse into exactly the type of content you create. After that, I visit that pin on Pinterest and then repin it to all relevant boards I have on my account. Some of your followers will only be following one of your boards. And because of Pinterest's algorithm, your followers won't see duplicate pins in their feed. So, by pinning your content to multiple boards, you're increasing the likelihood that someone will see it on Pinterest. Schedule content to your Pinterest account. Two popular Pinterest schedulers are BoardBooster and TailWind. I personally use and love BoardBooster. On BoardBooster, it's very easy to schedule new pins to your boards. You simply pin your scheduled content to a "secret" board and then BoardBooster automatically publishes it to your Pinterest account based on a timeframe you create. When scheduling, I recommend including a mixture of your own content and other people's content. Often, if you're not seeing much traffic from Pinterest, it's because you're not pinning enough of your own stuff. Aim for 20-30 percent of your own content and 70-80 percent of other people's content on your boards. Why does consistent pinning help you get ahead? Well, not only are you putting your content in front of new users on a daily basis, but you're also pumpin' up your Pinterest SEO. Whether you're utilizing SEO for Google or for Pinterest, one of the most common "laws" of SEO is that you should regularly share great content. By pinning content to your boards on a daily basis, you're increasing your chances of having your pins appear at the top of someone's feed (which will eventually lead to more followers, traffic, and subscribers!). If you implement these three concepts on Pinterest, you will be well on your way to a growth spurt for your brand.